HUGE news country fans!! Zac Brown is back with their 8th headlining tour! 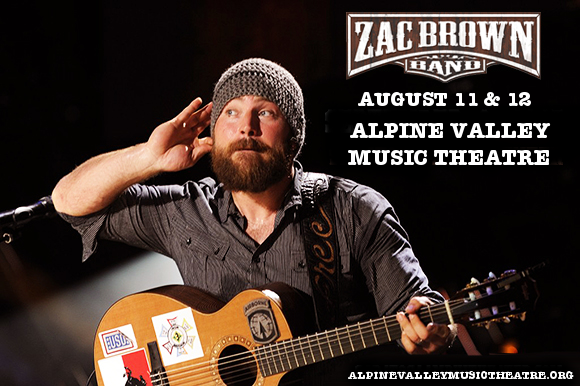 The Down The Rabbit Hole 2018 jaunt will bring the Zac Brown Band to the Alpine Valley Music Theatre LIVE on Saturday 11th August 2018! Grab your tickets NOW before they sell out and get ready for a truly unforgettable concert experience!! With an incredible sixteen singles on the Billboard Hot Country Songs and Country Airplay charts, thirteen of which have reached number one, including “Chicken Fried,” “Colder Weather,” “Beautiful Drug,” and “Sweet Annie,” and millions of record sales the world over the Zac Brown Band are undeniably one of the biggest acts in country on the planet!! The band are currently on tour with their latest album, 2017’s “Welcome Home,” described by Taste Of Country as one of their most “Mature,” records yet. With three Grammy Awards already under their belt, the Zac Brown Band look set to potentially win another this year, with a nomination in the Best Country Duo/Group Performance category for the single “My Old Man,” their ninth Grammy Award nomination so far!! Celebrate with the band live on Saturday the 1tth of August – book your tickets to see the Zac Brown Band live TODAY while you still can! !